Our Ambassador Ali'i Luau Package provides you with all of Polynesia: Full-day generall admission, plus our award-winning Ali'i Luau dinner, and our amazing HA: Breath of Life evening show. If you like to smile, even laugh – a lot – come see one of the Center's most popular cultural demonstrations. Learn how to make fire by rubbing two sticks together, how to easily crack open a coconut using a small pebble, how to create coconut "milk" with your bare hands, and how the Samoans prepare their food (hint: it’s a man’s duty). Watch well-muscled, young natives climb 40-foot coconut trees – in bare feet. See real-life living quarters, cooking huts and a chief’s home, all built without nails. And then, get a taste of real Samoan food, prepared throughout the day. Matter of fact, you can help us prepare it. Come listen to Maori natives explain the symbolic significance of their intricately carved meeting house and their unusual facial tattoos. You’ll discover the ancient origins and meaning of protruding their tongues, and you’ll see tattooed warriors do so while performing their stirring war dance – the haka. There’s no such thing as a “little drummer boy,” or a little drum, in Tonga. The popular Tongan presentation introduces you to Tongan ta nafa or drumming. With any luck, you’ll be called on stage to demonstrate your sense of rhythm on the oversized native drums. At the same time, you’ll learn the simple yet graceful motions of a mauluulu sitting dance, as well as the difference between clapping with a pasi or a fu sound. Sound complicated? It’s actually fun. A whole lot of fun. Another visitor favorite? The Tongan shuffleboard game, called lafo. Can you beat the villagers? Do pigs fly? Afterwards, try your accuracy with tolo, underhanded spear throwing. Ever heard of a lali (translated: log drum)? You will. And you’ll discover its cultural significance at the same time. You can even give it a try, unless you’re too busy checking out the wide array of devastating clubs and weapons native to the Fijiian culture. Beware, you’ll discover some mean-looking military hardware. After all, the Fijiians took war very seriously. The Tahitians really know how to swing their hips, not to mention their knees. See for yourself. Come enjoy an in-depth demonstration of both the women’s and men’s movements in their mesmerizing dances. In the process, they’ll get you shaking and shimmering yourself. And just try to stop your toes from tapping to the beat of the accompanying wooden to’ere drums. Learn why the Tahitians make both fragrant flower and beautiful shell leis. Then, if you want to sample a gourmet delight, stop by the cooking hut for melt-in-your-mouth, Tahitian coconut bread. Let your kids try some fishing from our little pier. Or, have a spear-throwing competition. It’s time to shake your hips, and tell stories with your hands. In the Hawaiian village you’ll not only learn some basic hula movements, but also discover the deeper commitment hula students make to their art, the intricacies of the motions, and the heritage of the hula implements and instruments. Gain insights into the ancient kapu, or taboo system, that meant men and women ate in separate houses. Learn how taro is harvested, cooked, and turned into the staple food, poi. Of course, you are also welcome to sample some. (A word to the wise, it’s an acquired taste.) Observe how women craft leaves and flowers into beautiful Hawaiian lei and other useful items. If you like to throw things, we have a long, sharp stick ready for you – also known as a spear. Our Tahitian villagers will teach you how to hit a coconut perched atop a tall pole 20 feet away. Good luck. Technique trumps might. Our Samoan villagers make starting a fire look easy and effortless. Don’t be fooled. It takes a lot of muscle, practice and skill. In the family hut in Samoa, you can try your hand at starting your own fire by rubbing two sticks together. Here’s a hint, you must use two pieces of wood from the same tree. The BANYAN TREE SNACK BAR, near the front entrance, is open at 11:00 a.m. and serves a variety of sumptuous specialty plates and sandwiches, as well as cold drinks and snacks – all of which will tide you over before dining at the Ali’i Lu’au. Additional SNACK STANDS are located at several villages (ie. Aotearoa and Marquesas) inside the Center. Challenge your family members or fellow guests to a canoe race – in native-style canoes like the islanders used centuries ago. Go ahead – make a splash and talk trash. Learn to cook the Samoan way, using sticks, stones, leaves, husks, coconut milk, taro, fish, plenty of patience, and – don’t tell mom – your fingers. Come early in the afternoon and help prepare the unusual entrees. Then return several hours later to sample the delectable results of your effort. The POLYNESIAN MARKETPLACE is styled in the tradition of village markets common throughout the Pacific islands. Find handcrafted items throughout the island villages and in the KAHA’IKI GALLERY, where you can shop with no entry fee. Stop in and shop as long as your wallet allows. Aloha! Welcome to our award winning Ali’i Luau. Here at the Polynesian Cultural Center we continue this ancient Hawaiian tradition of celebration together with ohana (family) and friends. Held in a covered outdoor venue against a background of waterfalls and lush gardens, the Ali’i Luau is a royal celebration of our cultural heritage, which includes the Royal Court Procession, presentation of the imu (pork baked in an underground oven), and delicious traditional food and lively Polynesian entertainment. RELAX & ENJOY THE RIDE. 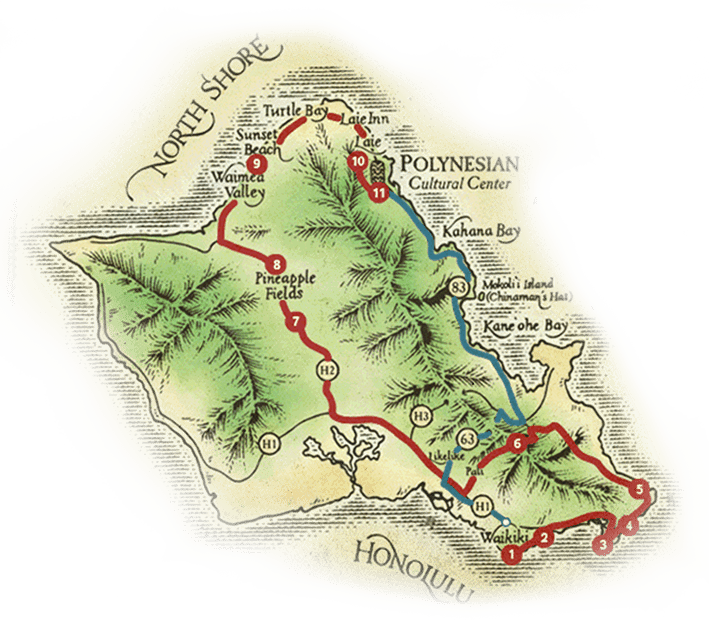 LET US DO THE DRIVINGI Enjoy a spectacular trip or beautiful beachside highway on Oahu. 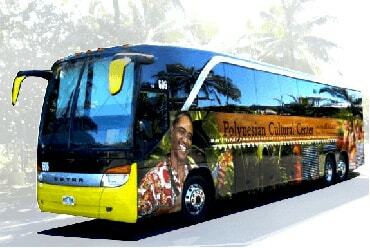 Transportation features a round trip transfer air conditioned coach and narrated by a local guide.